Bake and decorate your own royal wedding cake. 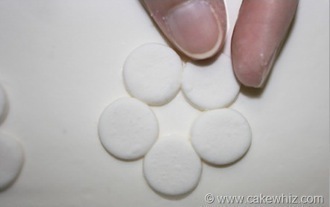 Roll out your white fondant. 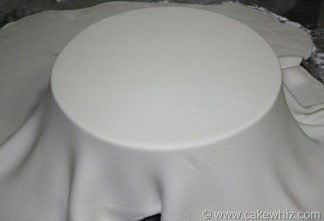 Tip: - Make sure your table is sprinkled with lots of powdered sugar or else the fondant will stick to the table. 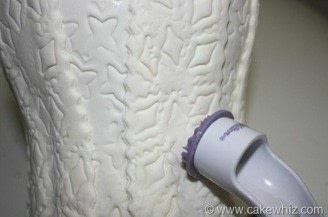 Cover your cake dummy in shortening or cover your actual cake in frosting. 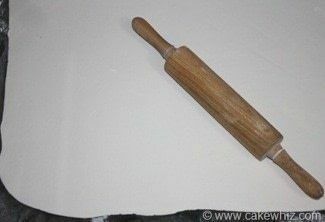 Then, spread the rolled fondant on top of it. 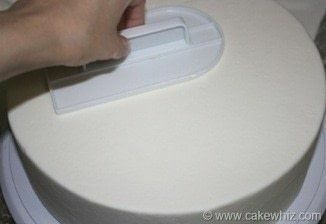 Use a pizza cutter to trim the excess fondant around your cake. 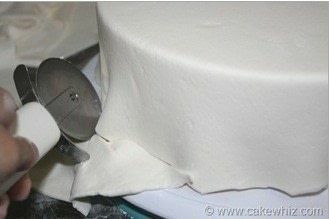 Continue cutting until you get very close to the edge of the cake. 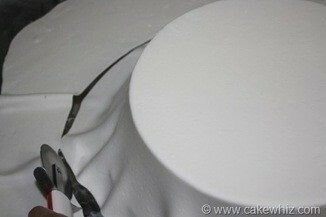 Now use a fondant smoother and press it all over your cake to smooth out fondant. 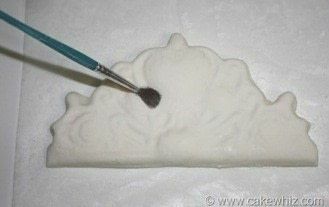 This will give your cake a clean look. 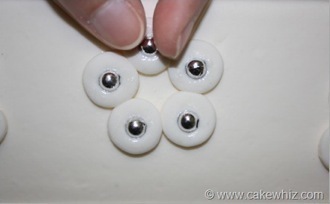 Follow the same steps to cover the rest of your cakes or dummies. 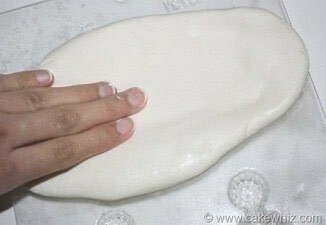 Also, don’t forget that if you are using real cake, each cake should be sitting on sturdy a cake board. Bring out your white satin ribbon. Brush some royal icing around the bottom of the cake and stick your ribbon along this area. 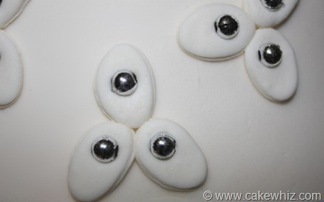 Since this cake is going to have a silver and white theme, use a glue gun to stick silver beads around the ribbon. 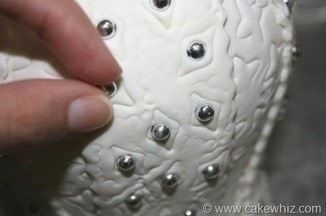 -Use a ruler to keep the distance between each bead consistent. 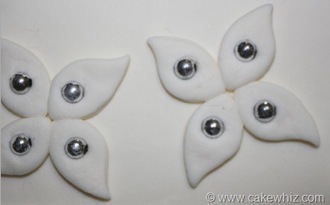 -You can omit this step ENTIRELY if you have fancy white and silver beaded ribbons. 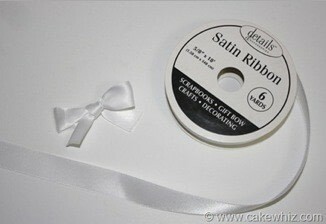 Make little bows out of white satin ribbon. 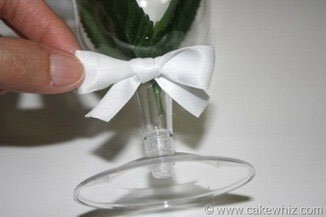 Bring out your champagne glasses and use a glue gun to stick the bow in place. - I think crystal glasses would look so much better than that the plastic ones but I didn’t have as many crystal glasses so I used these plastic ones to give you guys an idea. 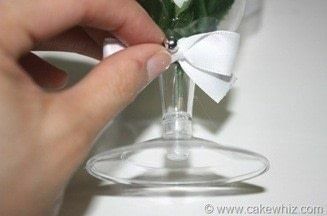 Keep in mind that if you are using crystal glasses, you would obviously wrap the ribbon around the glass instead of gluing it. To complete the look, glue a single bead on the center of the ribbon. 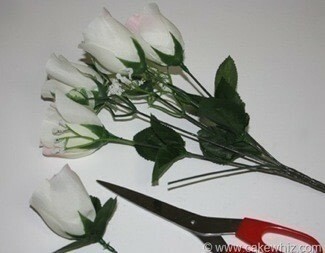 Bring out your silk flower bouquet and cut out individual roses using scissors. 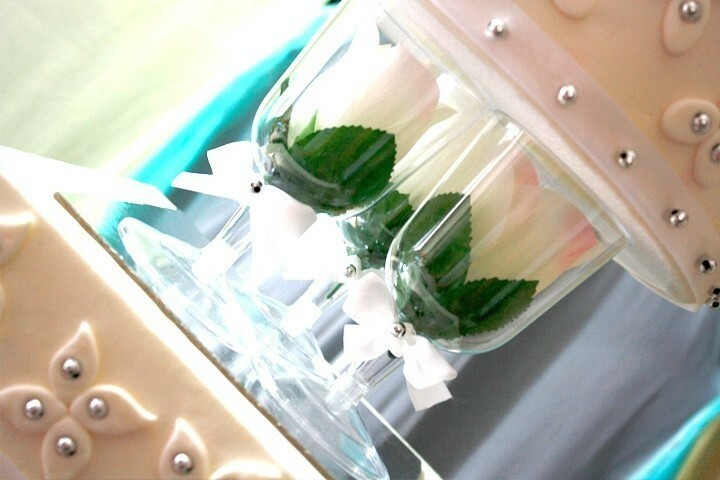 I think using fresh roses would look even better! 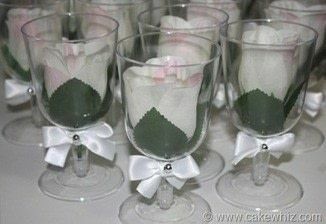 Place each rose into an individual champagne glass and you have successfully made your own cake separators! Looks beautiful …eh? 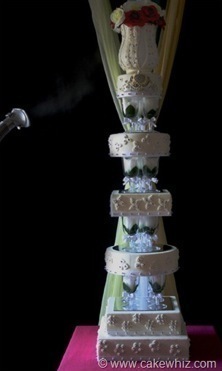 It’s really all about the little details that takes a cake from looking ordinary to extraordinary! 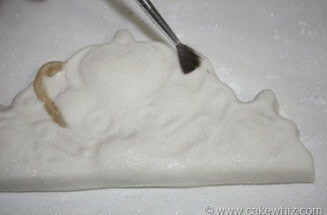 Bring out your crown chocolate mold and sprinkle some powdered sugar in the crown cavity. Sugar prevents the fondant from sticking to the mold. Roll out some fondant pretty think and place it over the crown cavity and press gently. 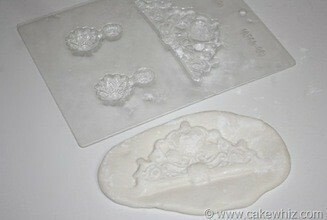 Then flip over your mold and the embossed fondant should fall out. 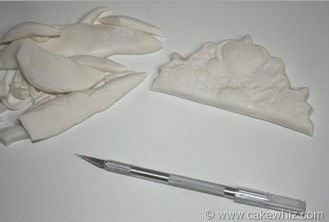 Use a sharp exacto knife to cut out excess fondant until you are left with a smooth fondant crown. Brush off all that powdered sugar. At this point, I placed this crown on a sheet of parchment paper/wax paper just so that it doesn’t stick to my table. Brush silver pearl dust all over the crown to make it shiny. Now, start painting on the crown. 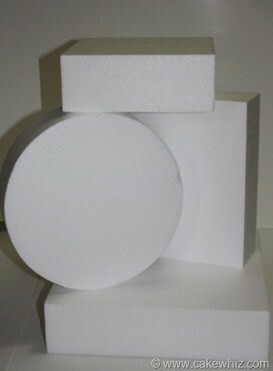 The mold has already embossed the entire design. You just need to paint on those bumps and cracks. To make gold paint, mix very little gold pear dust with vodka or clear vanilla extract and use this thick paste to paint. To make silver paint, do the same thing. 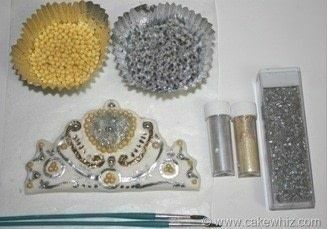 Add silver dragees and small golden pearls around the crown and let it all dry. 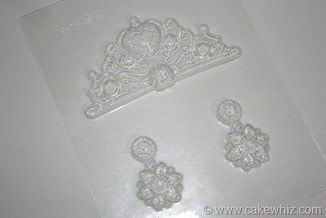 Tip: -Practice on some scrap fondant before working on the actual crown. This will give you a chance to get used to the paintbrush. - To make the gold slightly deeper, I added some copper pearl dust to my gold paint. 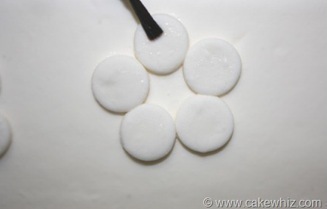 Mix some fondant with gum paste or you can use just gum paste too. 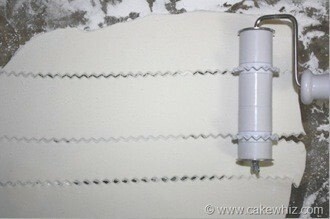 Roll it out and use Wilton’s fondant cutter with the zigzag edges to cut strips that are 1 inch wide. Use some shortening to hold these strips on a glass vase. After these strips dry, they would have the shape of this vase. I needed 12 strips to make this vase. So, I used 2 of these glass vases and let the strips dry. They took about a week to completely dry. 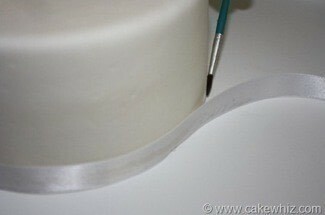 I used Wilton’s decorative fondant punch to create these fancy impressions on my strips. After a week, I removed all the strips from the vase and pasted them together with royal icing. Make sure to handle these trips gently or else they break or bend and lose their shape. 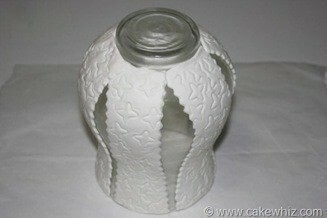 Use royal icing to stick silver dragees randomly around this vase. And your vase is now complete. Keep it in a dry place until you need it. 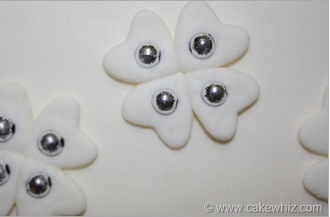 Roll out fondant and cut out circle shapes. Arrange those circles into a flower cluster. Brush water where you want these clusters to be positioned. Brush some water on top of each circle. 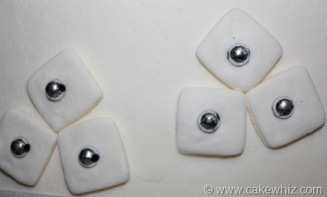 Stick a silver dragee into each circle. The water helps to stick it in place. Follow the same steps for the other shapes. And the heart flower cluster…. And the leaf flower cluster…. And the oval flower cluster…. 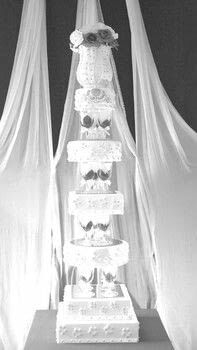 And the basic flower cut out…I used this one on the very top tier so that the focus is on the crown and vase rather than flower clusters. 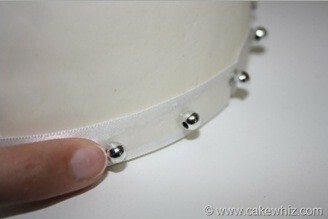 Stick the crown on side of the 8 inch round cake with royal icing. It should stick within a few minutes. Now, place the 12 inch square cake at the bottom and place the 10 inch square cake on top of that. 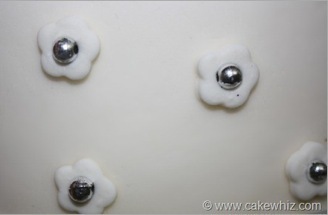 Make sure your cakes are sitting on cake boards. 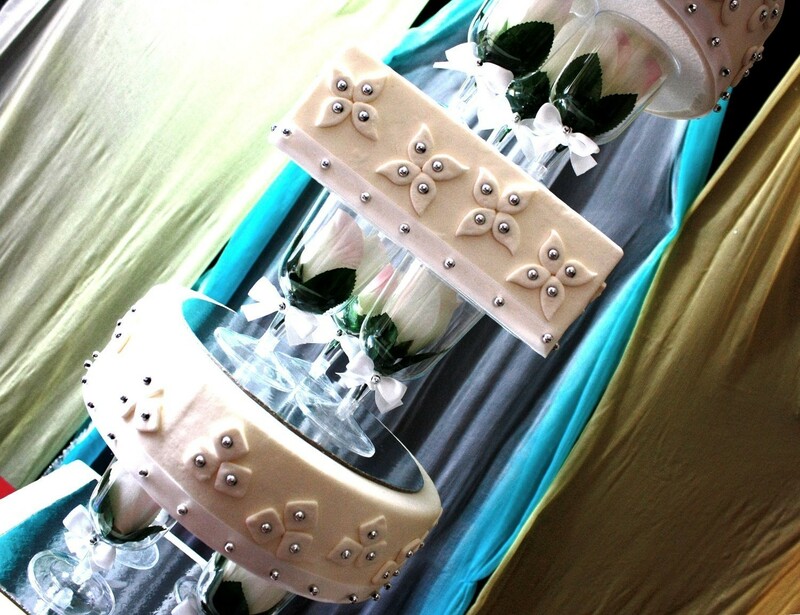 Also, you need to use dowels in each tier to provide your cakes with support. Next, place 4 champagne glasses on top of a silver cake board. Now place the 12 inch round cake on top of these glasses. 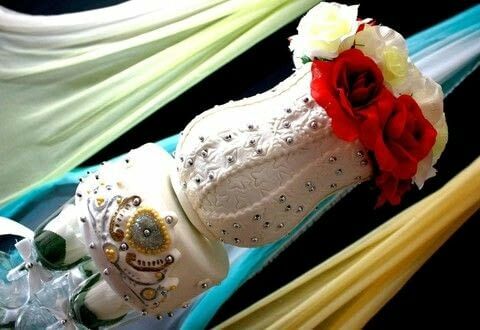 Place 3 more champagne glasses and place the 8 inch square cake. 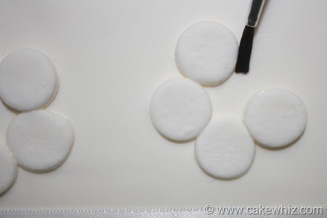 Then, place the 10 inch round cake and 8 inch round cake with champagne glasses in between them. 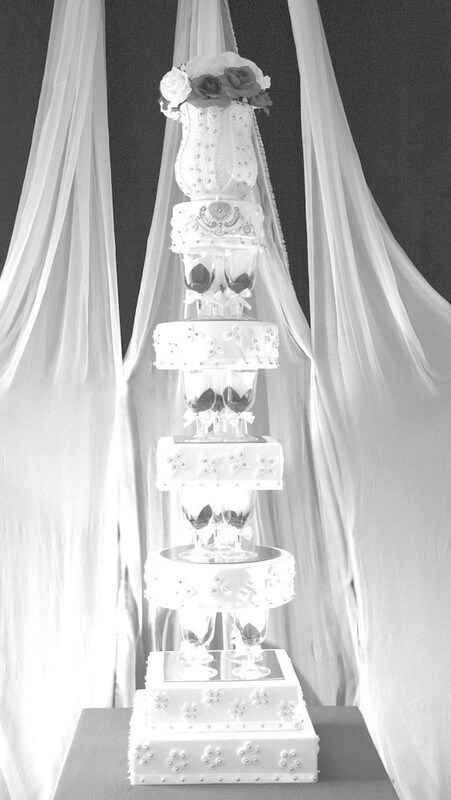 Finally, place the vase on the top tier. Fill it with red and yellow flowers. Give everything a steam with a steam iron. 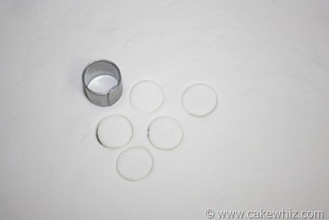 This makes the cake smoother and shinier. And you are done! This is so beautiful! I think I may use the cups for support between the layers on my daughters birthday cake next month. she's turning 18 so I'm thinking of filling the cups with lottery tickets and gambling tokens..but the cake is just beautiful!